As is the tradition here at Bunny and Brandy's Brunchtime Blog, Brandy has decided cook up something special for this year's Super Bowl which would please fans of either team, whether its the Denver Broncos (Brandy refers to them as the "Colorado Ponies") or the Seattle Seahawks (or as Brandy prefers, the "Northwestern Kestrels"). 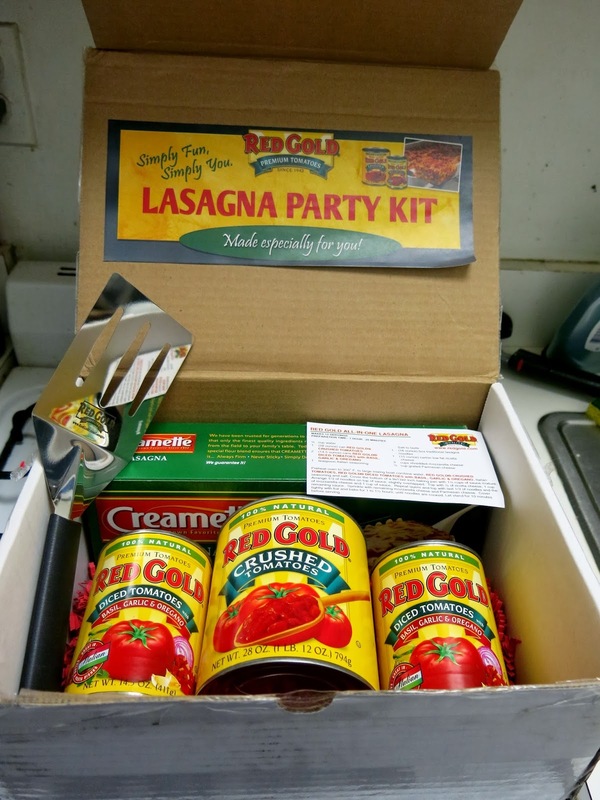 Luckily, the fine people at Red Gold Tomatoes have come up with a brilliant idea for stirring up culinary creativity in their All in One Lasagna Kit, which comes complete with a box of noodles, the ingredients for the perfect tomato sauce, an easy to follow recipe, and a shiny new metal spatula. 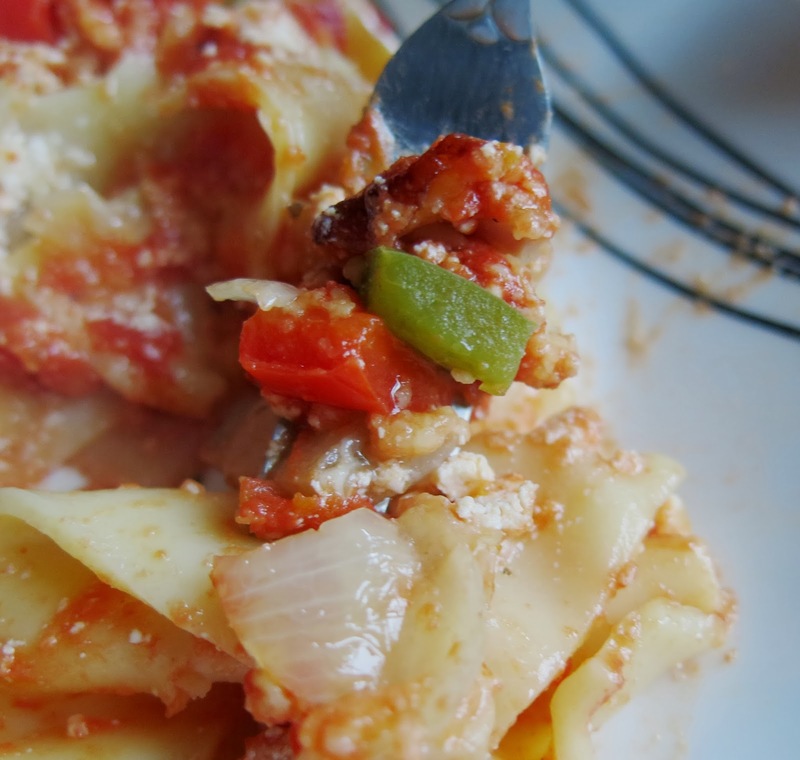 The idea behind the kit is to allow anyone, from beginner home cook to tired professional chef after work, to make a hearty, flavorful, and satisfying lasagna quickly and easily which can be elevated by adding personal little touches to the basic recipe. It was upon this canvas that Brandy chose to paint a little by creating two unique lasagnas themed on the cities fighting for the crown of Super Bowl Champion. Make sure to check out Red Gold's Facebook page as well as their website for an ever growing database of even more exciting lasagna ideas! This recipe combines Red Gold's basic All-In-One Lasagna Recipe with the classic flavors of a Denver Omelette to create a colorful new twist on the traditional dish. Heat a skillet to medium heat and add the pancetta. Saute until the pancetta begins to crisp, then add onions and peppers. Cook together until the onions are translucent, then set aside. Preheat oven to 350 degrees. 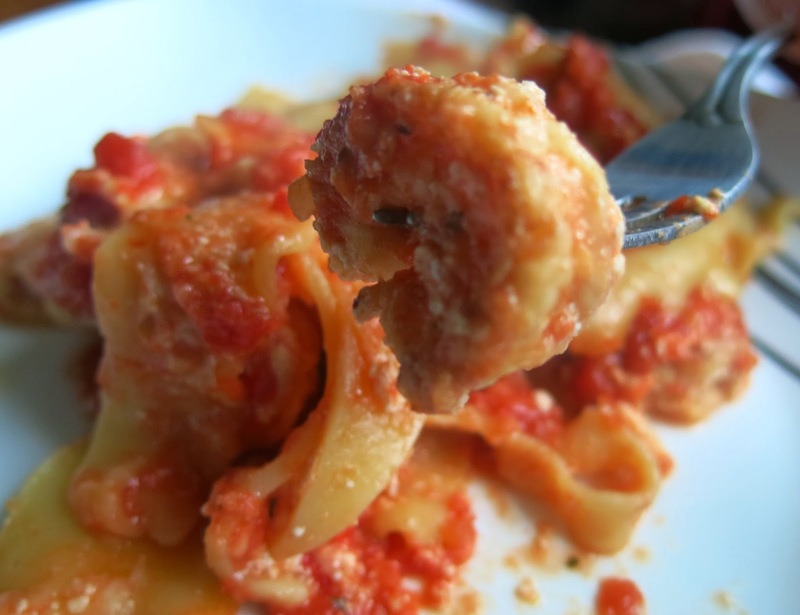 In a large mixing bowl, combine water, crushed tomatoes, diced tomatoes, Italian seasoning, and salt to taste. Cover the bottom of a 9x13x2 inch baking pan with 1 1/2 cups of sauce mixture. Arrange 1/3 of the dry noodles on top of sauce, slightly overlapped. Top with 1/2 of ricotta cheese, then 1/2 of pancetta mixture,1 cup of shredded cheese, and 1 cup of sauce. Repeat layers, then top with last 1/3 of noodles and the remaining sauce. Sprinkle with remaining cheese. Cover tightly with tin foil and bake 1 to 1 1/2 hours, or until the noodles are cooked. Let stand for 10 minutes before serving. This recipe combines Red Gold's basic All-In-One Lasagna Recipe with the classic flavor of Shrimp Scampi, celebrating the abundance of fresh seafood available in the Northwestern United States. Heat a medium skillet to medium heat and add the butter. Once butter is melted, add the garlic and saute for 2 minutes on low heat. Add shrimp and sear on each side for about a minute, adding salt to taste. Remove from heat and set aside. Preheat oven to 350 degrees. In a large mixing bowl, combine water, crushed tomatoes, diced tomatoes, Italian seasoning, and salt to taste. Cover the bottom of a 9x13x2 inch baking pan with 1 1/2 cups of sauce mixture. Arrange 1/3 of the dry noodles on top of sauce, slightly overlapped. Top with 1/2 of ricotta cheese, then 1/2 of the shrimp and garlic slices,1/2 cup of shredded cheese, and 1 cup of sauce. Repeat layers, then top with last 1/3 of noodles and the remaining sauce. Sprinkle with remaining cheese. Cover tightly with tin foil and bake 1 to 1 1/2 hours, or until the noodles are cooked. Let stand for 10 minutes before serving. Ever since being properly introduced to American football at the beginning of the fall last year, Brandy has made a determined effort to keep pace with the weekly competitions, often spending her Sundays afternoons (after brunch, of course) at her local pub, watching along with all of the other enthralled fans. "I may not understand what's happening half the time, but I love being caught up in the excitement of the crowd," Brandy says, "That and when we get to yell at the referees. Reminds me of the time I was a part owner of Manchester United. But that's another story..."
To watch the final weekend of playoffs, Brandy decided to combine her lust for sport with her brunching routine by killing two birds with one stone at The Monarch on the border of Bucktown and Wicker Park. The small, closely packed space seemed rather run of the mill at first with its exposed brick wall, high tables, and dark wood bar, but there was a secretive, almost hidden sophistication to the place. Little touches like a wax drenched silver candelabra on the bar and repeated heraldic symbols throughout the room gave a sense of history and decorum. The menu too had its own hidden treasures. Aside from the usual bar fair of burgers, fries, and the like, there were also more exotic choices like mussels with fennel and French toast with blood orange and mascarpone cheese. While she mused over the choices, Brandy ordered up a mimosa, which while not exactly unique, was still nicely bright. Finally, Brandy landed on a pair of sweet and savory dishes to snack on as she watched the champions of the gridiron battle it out on the big screens above the bar. First up was the Sweet Spiced Pretzel with a side of cinnamon raisin cream cheese. Brandy was simply staggered to find that the order came with not one, but two freshly baked pretzels, which were slathered in cinnamon and sugar. Pulling the mouth watering confection apart and dunking it into the cream cheese made the perfect combination of flavors: the salty skin on the pretzel mixed with the spice of the cinnamon, the sweetness of the sugar, and the creamy, thick cream cheese was comforting, familiar, yet surprising. For her savory, Brandy chose the Chilaquiles with Duck Confit. The dish had a nice mild punch from the salsa on top, countered by a creamy cool note from a little dab of queso fresco. Though the duck was not as plentiful as she would have liked, the meat was still tender and well seasoned. The tortilla chips that formed the foundation of the dish had the perfect soft texture, yet retained their integrity, which can sometimes be a difficult state to achieve. The eggs on top were perhaps the slightest bit over done (the yolks were glossy, but not runny), but served their purpose in trying all of the ingredients together into the perfect hearty breakfast dish. So enraptured by her dishes for a brief while was Brandy that she completely lost track of the games being played until a mighty roar went up from the crowd. "What happened?" Brandy asked her neighbor at the bar. "The Broncos just won! They're going to the Super Bowl!" he exclaimed. "Well isn't that lovely," Brandy mumbled, tearing another piece of off her pretzel. "Say, is that any good?" her neighbor asked. "It's very good. Here, have some for yourself, I'll never finish both of these things." "Thanks! Want to try some of my fries? They came with truffle mayo." "Truffle Mayo? Absolutely, dear boy!" Brandy exclaimed, reaching over to his plate. Only one bartender manning both table orders and the substantial bar meant service was a tad slow, but the friendly atmosphere was certainly enough to make up for it. "I'd gladly make this my permanent football watching pub for the rest of the season," Brandy told her neighbor. "But the season is over," he said, confused, "There's only the Super Bowl left." "Oh. Well then... I suppose I'll just have to come here to watch some other sport. What do you suggest?" "Um... the Winter Olympics?" "Perfect. See you all in February for Curling and Figure Skating everyone!" The jubilant crowd, probably still full of cheer from the game, roared in response to her. Brandy has always been a great lover of art in all its forms. "Art is just a term for stimulating the senses and in turn the brain," Brandy says, "Music for hearing, fashion and textiles for touch, perfume for smell, paintings and sculpture for sight, and of course, food for taste." Though she appreciates art in all its forms, Brandy definitely does have her preferences (she once got kicked out of a museum for yelling profanities at a minimalist painting of a white square on a white canvas). "Seeing as I have no artistic talent whatsoever, if I can look at a piece and know that I could have created it, I don't consider it art," she says,"And the same goes for food, by the way." This is perhaps why one of her favorite places in Chicago is the Art Institute, which houses such a massive and beautiful collection of historical and modern pieces of art that one could get lost for days in a Stendhal Syndrome induced haze of ecstasy and wonder. As Brandy's good friend Mama Bee (owner and operator of the Honey Bee Bakery honey empire) was just about to end her trip to Chicago, Brandy thought she might enjoy a little trip to the Art Institute to see the such iconic works as American Gothic and A Sunday Afternoon on the Island of La Grande Jatte (Not to mention the current food related exhibit Art and Appetite: American Painting, Culture, and Cuisine, which runs until January 27th). It was only upon buying tickets for the museum that Brandy remembered there was a world class restaurant attached to the Art Institute in the form of Terzo Piano (which had created one of Brandy's favorite dishes during last year's Chicago Gourmet Festival), and they just so happened to have a Sunday brunch service. "Well, I can't very well pass that up, can I!" she said to herself, and immediately made a reservation. The interior of Terzo Piano was befitting of its home in the Modernist wing: open, clean, warm beachwood floors, white walls, tables, and chairs, and flashes of color from the little installations scattered around the dining room. Brandy supposed the space was very adaptable for big events and ceremonies like wedding receptions and the like, as it could easily be rearranged and sectioned off as need be. The views from the huge windows were quite breath taking (if one didn't look down at the desolate train yard below), showcasing everything there is to love about Chicago's architectural wonders. Mama Bee and Brandy started off with a couple of drinks: for Mama Bee, a Peach Bellini and for Brandy, a house made pomegranate and thyme soda. Mama Bee's bellini was bright and clean with a pure peach flavor that really shone. "Oh my, how delicious!" Mama Bee exclaimed, "It's like a sip of summertime in the middle of the winter!" Brandy, who shockingly had chosen a drink without any alcohol in it, absolutely adored the house soda, which was instantly refreshing, not too sweet, and had a subtle herbaceous kick that really helped to make it more of an adult beverage. "I was worried it might taste too medicinal, but it's actually quite lovely," Brandy said thoughtfully, "Though it could use a splash of rum." As an appetizer, the pair ordered up the Flatbread with roasted garlic, parmesan, ricotta, wilted greens, and a fried egg. Both ladies loved the presentation of the flatbread, which got carved table side for their enjoyment. The bread itself had a wonderful wood fired char to it, which melded nicely with the salty cheese and sharp greens. The over all effect was garlicky, buttery, and delicious. Mama Bee chose the Tortilla Española for her entree, which consisted of onions, potatoes, eggs, and romesco sauce, and came served with a small salad on the side. Mama Bee felt the dish was a bit on the bland side and could have benefited greatly from a healthy hit of salt or some sort of seasoning other than the sauce. The eggs were the best part with their fluffy, unique texture that came from being baked in an oven. The potatoes had a good texture as well, but the onions were non existent (except for one small pocket of them in the center) and the tortilla seemed lip and useless. "I would have hoped for a more creative presentation as well," she lamented, "I know the food is supposed to be rustic Italian fair, but the restaurant is in the Modernist wing of an art museum after all! A little bit pf pizzaz would have been nice." Brandy's entree of choice was the House Burger, which came topped with pickled zucchini slices, taleggio cheese, and a creamy herbed aioli. Brandy had to agree with Mama Bee in regards to the presentation of the dishes, which was rather pedestrian considering the location and higher then average price point. "I'm not expecting a plate by Picasso or Pollock, but a little arranging of the food might have been nice. Like how the flatbread had a little panache to it." The burger itself was juicy and flavorful, with a perfectly soft bun to hold it in place. The creamy yet pungent cheese and sauce added to the burger's decadence, but the star was the pickled zucchini slices, which brought a unique touch of tangy sweetness. Finishing off their meal, Mama Bee and Brandy decided to split the Tiramisu Waffle, which again lacked a little in the presentation department, but made up for it bit time in taste. The waffle itself had a subtle nutty flavor, but the rich coffee scented mascarpone cream that topped it was truly magnificent, or as Brandy put it, "Its like the melty last bits of a truly wondrous gelato sundae." The waffle did go a soggy quite quickly, but a good hit of texture was added by some crunchy cocoa nibs that had been sprinkled on top. The prices were a tad steep, the service was quick and friendly, and though their expectations were crushed a little when it came to the look of Terzo Piano's food, the strong, bold flavors made Mama Bee and Brandy's brunch a very stimulating experience. "And now to stimulate our other senses and walk off all that food in the museum!" Brandy said, pointing the way and waddling across the expansive floor. Though Brandy doesn't harbor any moral objection to vegetarianism, she's always felt a deep sadness for those who choose and/or are forced to limit their their ability to be adventurous when it comes to their meals. "We all know that variety is the spice of life, and spices taste much better on a slab of meat than they do on some wilted spinach or a bed of beet slices," she often says, "I understand that some people don't want to harm animals, and that's fine. Just don't try to tell me a portabella mushroom tastes as good as a steak. It tastes good on a steak, but not better than one." Brandy's current rant against the herbivores of the world started when her good friend Mama Bee told her the story of how she had recently received a request that her honey empire develope a "vegan honey." "I mean, have you ever heard of such a thing?!" Mama Bee scoffed, "The idea that somehow I could make a better product than my bees can is ridiculous! If you don't want to use animal products, then use corn syrup for goodness sake! Honey is a very specific thing, and the second you start tampering with it, its not honey any more!" "I couldn't agree more," Brandy sighed, "Its like all this catering being done to please the vegetarians. Fake chicken, fake sausage, fake bacon. For goodness sake, you just don't desecrate a wonderful thing like bacon with all those chemicals and crazy concoctions! As a matter of fact, I'd like to see a restaurant that makes no compromises to the vegetarians. Somewhere that puts its love of meat on display!" It was decided then that Brandy would take Mama Bee to The Publican, deep in the heart of the meatpacking district on Fulton Market. The Publican has long been a bastion for Chicago's carnivores, basing its menu on fresh seafood, oysters, and pork dishes. Upon arrival, the two ladies found the inside to be open and spacious, but with a relaxed feeling not typical of other more highbrow restaurants in the area. The large windows at the front, where Brandy and Mama Bee were seated, poured sunlight into the mostly warm wood room, creating an inviting dining space, and giant stylized portraits of hogs lined the walls, giving Brandy the feeling of "Being in a restaurant owned by an ex-farmer who'd done well for himself." . Brandy and Mama Bee started off their morning with a couple of cocktails; a traditional Bloody Mary for Mama Bee and a concoction called the Michael's Virtue for Brandy. Mama Bee, who was unfamiliar with the tradition of a beer chaser for the Bloody Mary, also chose the Three Floyds Ale from the options on the menu. The Bloody was pleasantly spicy with an almost sweet tomato base (there was an even spicier option on the menu, causing Mama Bee to wonder what kind of sadomasochist could order such a thing). "I can see why you need the beer chaser!" she exclaimed, "Otherwise my delicate palate may well burst into flames!" Brandy's cocktail, the Michael's Virtue, was a zingy mix of apple brandy, bourbon, blackstrap rum, and pumpkin spices. Brandy actually found it to have quite a sour kick with an almost citrus like flavor and a smooth finish. "Not quite what I expected, but lovely never the less," she concluded. For her entree, Mama Bee zeroed in on the Maple Ham, which came with potatoes, sauteed escarole, cider mustard, and a fried egg. The ham was fork tender and simply melted on the tongue into a mass of sweet, meaty goodness. The mustard, which was presented with the seeds ever so slightly cracked, lent a very nice and elegant bite to the dish. "Normally I do prefer a honey glazed ham, of course," Mama Bee said, "But this plate is really something special. Like lots of clear, resounding notes adding up to one harmonious chord." Brandy chose the Baked Polenta as her entree, which came rustically served in an iron pan with some oiled country bread on the side. There was a great saltiness to the polenta from the parmesan and fontina cheeses, which while plenty gooey, didn't overwhelm the rest of the dish with richness due to the the well balanced acid from the chunks of tomato. Some swiss chard also helped to add to the heartiness of the dish, contrasting with the melty, soft texture of the polenta itself, which in this instance resembled more of a porridge than grits. Brandy's favorite part was scooping up heapfulls of the stuff with her toasted bread, wishing she had more of the slices. Brandy had also ordered a side of the House Bacon, knowing how famous the restaurant is for its self cured and butchered meats (so famous that on the opposite corner to the restaurant is Publican Quality Meats, which delights foodies and chefs with its varieties of exotic meats, home made sausages, and the hand cut chops of yester-year). The bacon came in two thick blocks, coated in maple syrup. The meat was fatty, tender, sticky sweet, and crunchy with a beautiful caramelized char on the edges. "This is no run of the mill bacon," Brandy moaned, "This is the king of bacon. No, not just the king, the Holy Roman Emperor of bacon. It should come with a certificate of its lineage." Stuffed as they were, Mama Bee and Brandy decided to sample some dessert. Mama Bee went with the Cinnamon Streusel Coffee Cake. The cake was extremely moist, which can sometimes be a downfall of coffee cakes, with a warm vein of cinnamon running through it. "Its pretty traditional, but done very well, I must say," Mama Bee said cheerily, "Could use a dab of honey though." Brandy picked the Old Fashioned Donut for her sweet finish, vaguely surprised that there was no meatier options for dessert. The donut was also fairly traditional, but done well, with an intense hit of vanilla from the glaze, a melty cake like texture, and a rich, slightly tangy buttermilk flavor. "The perfect thing for enjoying with a little coffee," Brandy proclaimed, "Could use a chuck of that bacon though." Having thoroughly proved their point (to no one in particular) that real meat dishes are best kept simple and rustic, Brandy and Mama Bee waddled out of The Publican. The service had been fairly attentive, though lacked a little friendliness that one might expect from such a relaxed atmosphere, and the prices had been a bit on the steep side, though nothing too outrageous when one took the quality of the dishes into account. "I'd like to see a vegan version of the meal we just ate!" Brandy proclaimed, "You can alter all the beans, wheat gluten, and ground cashews you'd like, but nothing will ever come close to the glory that was a simple side of bacon." Every year around Christmas, Brandy finds herself growing home sick for dear old Britannia. "It may not snow as much as Chicago, but there's just something magical about England at Christmas," Brandy often sighs, "Americans don't understand the joy of a lovely mincemeat pie, a plum pudding with hard sauce, or a pre-Christmas panto performance. For goodness sake, they don't even take off for Boxing Day! I mean that is just ridiculous. When else are you supposed to pull all the leftover crackers?" Knowing how down Brandy gets this time of year, her good friend Mama Bee, owner and operator of Honey Bee Bakery, decided to do something about her gloomy attitude. Luckily, as the well connected honey baron she is, Mama Bee came across a little grocery in Lakeview called Spencer's Jolly Posh Foods, which specializes in English and Irish goodies (she also knew that Brandy had become a bit fan of their British style sausages and bacon via one of the many stalls they maintain at local farmer's markets). A little more investigating turned up the fact that Spencer's actually houses a tiny cafe, from which they serve sandwiches, desserts, and best of all, a traditionally British cream tea service. "This is just the thing to take the Briney out of that old Brit and put a little sweetness in her Saxon!" Mama Bee exclaimed. Stepping into Spencer's Jolly Posh was like coming home to Brandy. At once her eyes lit up at the site of Walker's Shortbreads in nutcracker tins, fridges full of White Stilton and Wensleydale cheeses, English candies like Curley Whirleys and Licorice Allsorts, and even a bin of Fairy Liquid (otherwise known as dish soap to us Americans) in the corner, in other words, every box, bag, jar, and can an Anglophile could ever want for their larder (or pantry). Though the actual space for the cafe was a little small and cramped, Brandy found it absolutely charming to be surrounded shelves housing boxes of Twining's, curry sauce mixes, Mars Bars, and the like. Even the condiments left on the small wooden tables seemed to delight her. "Real HP Brown Sauce!" Brandy squealed with delight, picking up a square shaped bottle. The cream tea started off with a pot of tea, naturally. Brandy and Mama Bee picked the Winter Spice, a warm and slightly orange scented tea which came served in an adorable orange ceramic pot and two officially branded Spencer's Jolly Posh Foods mugs. "Well now, I'd thought we'd be getting a porcelain pot and dainty teacups and saucers!" Mama Bee said in slight surprise. "Don't be silly, dear. This isn't a high tea, its a cream tea. Much more casual," Brandy retorted, "We're not in an episode of Downton Abbey. Now, one lump or two?" The edible portion of the cream tea came next with three lovely selections served up on a tiered tray; the bottom plate housed a selection of finger sandwiches, the middle two freshly baked scones with pots of strawberry jam and clotted cream, and on top a variety of pastries. Working their way up from the bottom, Brandy and Mama Bee dived head first into the sandwiches, which came in three varieties: Ham and Tomato Relish, Cheese Salad, and Salmon and Cucumber. The ham was nice and tender with a good sweet kick from the relish and an earthiness from the soft wheat bread. The salmon had a subtly smokey flavor and provided a study in contrast with the crisp cucumber. "This one makes me feel so fancy!" Mama Bee whispered, raising her pinky as she took another bite. The cheese salad was the favorite of both Brandy and Mama Bee for its rich, smooth flavor from the sharp cheese mixed with a creamy mayo. Next were the scones with jam and clotted cream. The scones themselves were tender and crumbly with juicy bits of raisins and just the slightest hint of salt. Brandy had to instruct Mama Bee on the proper application of the strawberry jam and clotted cream (a spread that is somewhere between cream cheese and butter), which just enhanced the scones that much more. Lastly were the pastries, which consisted of a few French style macaroons, slices of lemon cake, and a little bit of sticky toffee pudding. The two macaroon flavors they had been given were a raspberry with a beautiful jammy filling and a toffee, which had a buttery, toasted nut flavor to it. The lemon cake was creamy and smooth with a good true lemon flavor. Brandy would have gladly eaten more of the sticky toffee pudding, which was just enough for one bite of rich, moist, and buttery goodness. Though everything had been light and refreshing, Brandy and Mama Bee found themselves pleasantly full from their leisurely afternoon tea. At only $22 a person, they both thought the delicious little bites were well worth the price, though there was certainly no money spared after the meal as Brandy proceeded to buy at least one of just about everything in the shop. "Mincemeat pies! And plum pudding!" she exclaimed, throwing items into her basket, "Now if only they had a boxed panto performance I'd barely be missing Mother England at all!"